Virtually all large and most medium size companies utilize long-term incentive awards (LTI) as the third leg of executive compensation alongside salary and annual bonus awards. The value of such awards continue to represent a significant portion of the compensation paid to senior corporate executives. However, we continue to see a shift in the types of grants being awarded as the concept of “pay for performance” expands further in the world of executive compensation. Our universe of LTIP awards includes: (1) stock options and stock appreciation rights (SARs); (2) restricted stock and restricted stock units (RSUs); (3) performance shares and performance units; and (4) market stock units. We recently reviewed the long-term incentive award practices of 325 Ayco corporate clients, updating a similar study conducted two years ago. Data is derived from information we collect regarding LTI grants to executives, as well as disclosures made in 2015 proxy statements. In this study, we specifically focus on the different types of long-term incentives now being awarded (excluding one-time grants, retention grants, or special awards). Most companies provide different allocations and types of awards to executives at different levels. For example, named executive officers (proxy reports), including the CEO, are more likely to receive awards that qualify for the performance exception under IRC §162(m). For purposes of this analysis, we will focus on the awards made to senior executives at the companies in our survey group. A generation ago, stock options were the primary, and often only, long-term incentive award granted to executives. Part of the reason was the more favorable accounting treatment that stock options enjoyed over full-value awards until rule changes that took place in 2004. Since then, we have seen a rejuvenation of restricted stock and RSUs which are generally perceived as more valuable and less risky as a pay element during periods of market turmoil. More recently, we have seen the rapid expansion of performance awards, including performance units, shares or share units and performance RSUs. Here are the different types of awards made to eligible executives within the past 12-18 months with an indication as to how the mix has changed over the past seven years. For more details as to the structure and design of stock options being granted currently, including types of options, when options are granted, vesting schedules and periods to exercise following certain events, see the March 2014 Digest. Many public companies report in their proxy statements the value of LTI awards as part of the “realizable pay” of key executives. This is a supplement to the value of equity awards reported in the Summary Compensation Table (SCT) of a proxy, which is likely to be the “fair value” at the grant date. Realizable pay replaces this value with an intrinsic value as of a defined date - such as year-end – based on the stock price as of that date. Thus, the realizable value for a stock option is the spread as of a defined measurement date. This is an estimated current value rather than a projected future value. 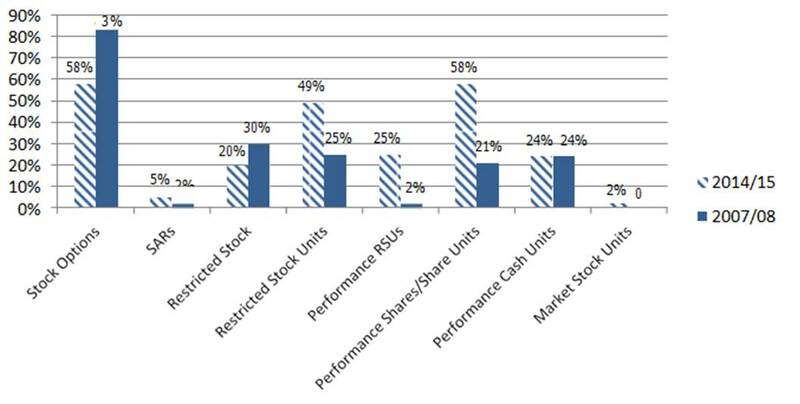 For restricted stock and stock units, this usually is the value at the scheduled vesting date. For performance awards it is the target value at the end of the performance period, as opposed to the grant date fair value in the SCT. The SEC has just proposed a new method of measuring and reporting executive pay in proxy statements (see the next article for a summary of a different metric that all public companies will be illustrating shortly – top executive pay compared to company performance). Tally sheets are used by the Compensation Committees at some companies to illustrate various components of compensation paid to each named executive officer (NEO). These summarize the number and value of all LTI awards, as well as the current values in benefit and compensation plans as of a stated date, plus what would be payable at retirement, other termination or upon a change-in-control of the company. 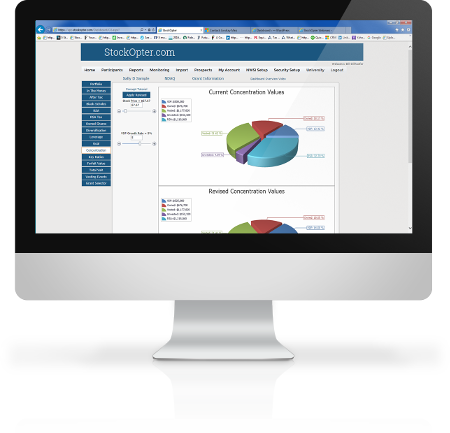 This can be used to compare and align total compensation paid to top executives with market data or for peer group comparisons. The SEC staff recently provided guidance as to the proper proxy reporting for equity awards (including stock options and full value awards) granted to a NEO who is retirement eligible where the award would be immediately vested at the earlier of the executive’s actual retirement or the normal vesting schedule. In this situation, the SEC confirmed that the company should disregard the retirement acceleration vesting provision and report the value of the award in the proxy compensation tables based on its “normal” vesting schedule, along with a footnote or other supplemental disclosure describing the accelerated vesting feature. The SEC also clarified that when a restricted stock unit (RSU) award has vested but payment following retirement or other separation from service is delayed for six months to ensure compliance with IRC §409a, it would be permissible to report in the proxy the value of the award for the year in which vesting is scheduled to occur, even if the actual payment (and the year of income taxation) would be the following year. More than a decade ago, almost all large U.S. companies used stock options as their primary and, in many cases, exclusive long-term incentive award for executives. There were a number of reasons for this, not the least of which was the accounting advantage that stock options offered to companies at that time but now eliminated. Since then, most companies have revised their mix of long-term awards and continue to do so on a periodic basis. Part of the rationale for this is the expressed preference by corporate governance groups for more “pay-for- performance”, plus meeting the challenges of stock market volatility, and the elimination of the accounting advantage of stock options. Most companies now utilize a mosaic of awards that provide a diversification of long-term incentives, which can add to the complexity of an executive’s understanding and planning a LTI strategy. 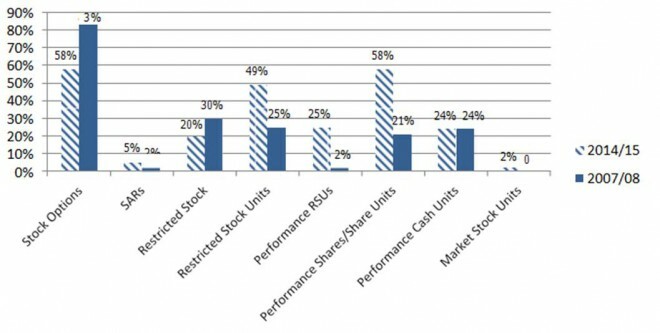 Restricted stock units (RSUs) are now being utilized by many more companies than their economic equivalent – restricted stock. While the value can be similar or the same, there are a number of important differences. For example, an §83(b) election can usually be made for restricted stock allowing appreciation following grant to be eligible for capital gains treatment, while this election cannot be made for RSUs. This election also then changes the tax treatment of any dividends payable with respect to the restricted stock received prior to vesting. The timing of income and FICA taxation can differ for each. Both taxes are due at vesting for restricted stock (assuming no §83(b) election is made), while RSUs are subject to FICA at vesting but income tax only when distributed. Finally, restricted stock is not considered deferred compensation subject to IRC §409A, while RSUs are generally subject to §409A rules. This means that payment following a separation from service may be delayed by six months to avoid the potential of a 20% penalty tax. The Office of Chief Counsel of the IRS recently issued guidance confirming that if an employer recognizes that the terms of a plan or agreement are not in compliance with §409A rules and makes a correction after an award is made but prior to when it is no longer subject to a substantial risk of forfeiture, the 20% penalty tax may still be payable (CCA 201518013). In the case in question, the terms of a retention bonus agreement with a 3-year vesting period and subsequent two-year payment period, allowed the company the discretion to pay the award in a lump sum. This violates §409A rules by allowing for an acceleration in payment. The company corrected the agreement, but the IRS ruling stated that the executive was subject to the penalty tax for the year the correction was made. These programs offer eligible executives a choice as to which type of LTI award they would like to receive – most commonly a choice between NQ stock options and restricted stock or RSUs. These programs blossomed about 8-10 years ago and we then counted 25 companies offering employees a choice as to their LTI award. Due to a number of issues, including having to communicate and explain the differences to employees, the proliferation of performance-based awards, and potential §409A timing issues if RSUs were offered, we have seen choice programs decrease in utilization. We currently see them in place at six companies in our survey group. However, they remain popular with employees. If you'd like to receive a summary of the design and communications for an equity choice program, contact us at Rfriedman@ayco.com.